Email Jack Garvin, Ed. D.
Jack Garvin holds a B.A. in Education and Ed.D. from Brigham Young University. 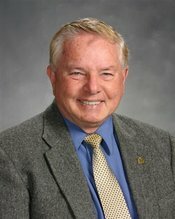 Dr. Garvin began his teaching career in 1957 in California and has served in public education for 41 years; 19 as Superintendent of the Orcutt Union School District. He was elected to the Santa Maria Joint Union High School District Board of Education in 2004. Dr. Garvin’s reason for running for the Santa Maria High School Board was to apply the same standards of sound decision–making and accomplishment that developed the Orcutt School District into an outstanding school system.